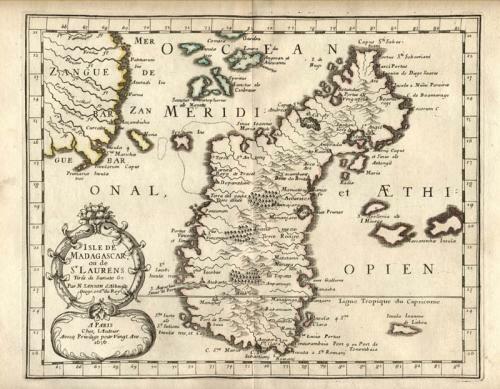 Fine, original, copper-engraved map of Madagascar, with adjacent islands and African mainland, with original outline hand-color, by Nicolas Sanson D'Abbeville. A fine dark impression, bright original colour, heavy paper, large margins, light browning near edges, engraved surface fine. Faint ink stamp of Western Reserve Historical Society on verso.